The Quickest Easiest Roast Chicken Dinner Ever! Wear contacts. Okay, some people will not be able to do this, but my wife wears contacts and she is the designated onion cutter. She worked in the kitchen of an assisted living center and they always had her cut onions because she wore contacts. Never heard this one. I’ll have to ask my sister to see if she concurs. She is my closest contacts contact. Interesting. Very interesting! Hmm, my husband wears contacts. I should get him the cut the onions next time to test out this theory. Ok, so you may look a bit goofy, but it works wonders, it’s really simple, and you won’t have to wait 20 minutes for your onions to freeze!! Take a slice of bread. Yup, a whole slice. Stick it in your mouth. Don’t stuff the whole slice in there – just enough so that it looks like you’re taking a bite, but you’re just letting the slice dangle from your mouth. 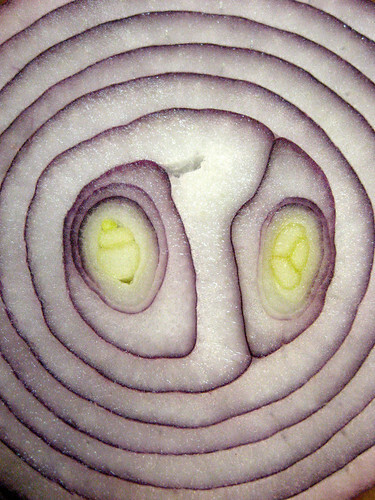 Cut your onion. Don’t cry. I told you it wasn’t pretty, but it works.